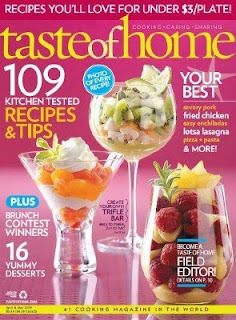 Centsible Savings: Hurry - A year of Taste of Home for only $2.00! Thanks to Money Saving Mom for the heads up on this great deal! Go here to sign up for a year's subscription for only $2.00! What's even better is you can subscribe for up to 4 years for $2.00 a year - so for $8.00 you can get 4 years. A one year subscription normally costs $14.99-19.99 each! When I got married, someone gave me a year's subscription as a wedding gift and it was one of my favorite wedding presents! As a new wife, I was constantly searching for cooking tips and recipes and found that Taste of Home had easy, great tasting recipes! And receiving a new magazine every 2 months challenged and inspired me to try new recipes - many of which I still use today! So a great gift idea for a Christmas gift or a new bride!